For busy people, time isn’t a luxury – but your vacation should be. If you’ve ever planned a trip, you know just how time-consuming it truly is, especially when you’re not familiar with the destination or you’re juggling multiple locations. Want to create a tailored experience for you and your family, without all the headache and hassle? 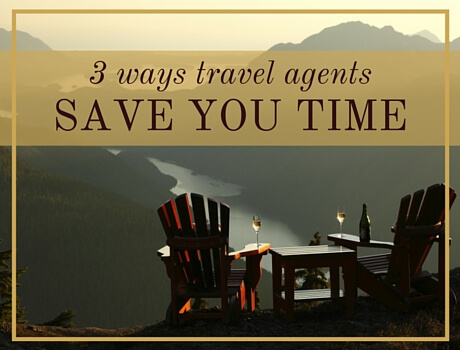 Here are 3 ways travel agents can save you time, every time. Researching what to do and where to book is no easy task. So you spend countless hours scouring the Internet, and you may even find yourself sifting through endless websites in search of the best deals. Eventually, option overload creeps in, and you end up choosing the wrong things because you’re so overwhelmed by everything that’s out there. It doesn’t have to be this way. In fact, creating a piecemeal itinerary isn’t the best use of your time (or the best way to save money). Travel agents have insider info about deals on flights, hotels and more that consumers aren’t always privy to. By letting a professional do the heavy lifting, they can vet your choices and package a whole itinerary that best meets your wants and needs. Having a location expert in your corner can help transform your ordinary vacation into a memorable experience. Sure, travel agents take trips for the love of exploring. But they also familiarize themselves with the areas they visit and make professional connections so they can VIP their clients. That means you’ll have access to better amenities and other options during your stay. Travel agents can also help you coordinate complex itineraries. Want to take your family of 5 hiking and snorkeling for a week, all while visiting 3 islands and staying at beachside hotels? Chances are, your travel agent can help you set that up in a snap. When you let an expert take care of things from A to Z, all you and your family have to do is kick back and look forward to your vacation. If you’re not sure where you want to go, but you have an idea of what you‘d like to do, a travel agent can help you choose a destination based on your specific travel criteria. Plus, you’ll likely get excellent recommendations on activities, places to eat and where to stay. Creating your leisure vacation requires a lot of organization and can make your to-do list expand quickly. Time spent booking flights, accommodations, car rentals, dinner reservations and much more can add up fast. And what’s more, if any last-minute changes come up, such as a cancelled flight due to poor weather conditions, you’ll have to scramble to make sure you’re able to get the next best flight. In turn, this could affect other arrangements and leave you frazzled. Why waste precious vacation time getting things in order that could be better spent with your family or fellow travelers? A great agent will be on standby throughout your entire trip and be available to handle unforeseen changes at a moment’s notice. And by working with an advisor, you’ll have a more flexible itinerary that helps buffer those unexpected emergencies or delays. Have you ever planned your own vacation? How did it turn out? Share your experience in the comments below.